Linda Leslie Brown, Fused, 2018, ceramic, plastic, rubber, plaster, paper clay, metal, silicone ?10" x 11" x 10"
It is always insightful and challenging to see new work by my former colleague and friend Linda Leslie Brown. In the often static academic art school context she was uniquely restive. Other than constant experimentation, growth and change there was no ready signature to the work. That is unlike the norm where young artists develop a look and with enough exhibitions on their resume secure tenure track, teaching positions. Having a steady paycheck often represents a shift to creating work as an afterthought. Too often decades pass and art professors lapse from serious critical attention. Art schools are where art goes to die a slow and painful death. Which in exceptional instances, like the work of Brown, is not fair or accurate to assume. There are times when one of her exhibitions kicked my tires. She threw something new at us. When critics and curators caught up to her she was bounding off in a new direction. That might be the challenge of exploring new materials or process. This was pursued as long as ideas were fresh and engaging. It was that creative energy that informed her teaching. It was very much in the Jasper Johns tradition of do something, do something to that, and then do something to that. Other than for a handful of most acclaimed artists that’s not always a recipe for success. For critics, curators, gallerists and collectors there is preference for the familiar. For the best artists that has little or nothing to do with the impulse and motivation to create a new body of work. The best piece is the next one. A long overdue major retrospective, however, would identify the thread that connects time and phases of her oeuvre. For the work of Brown indeed plus ça change, plus c'est la même chose. 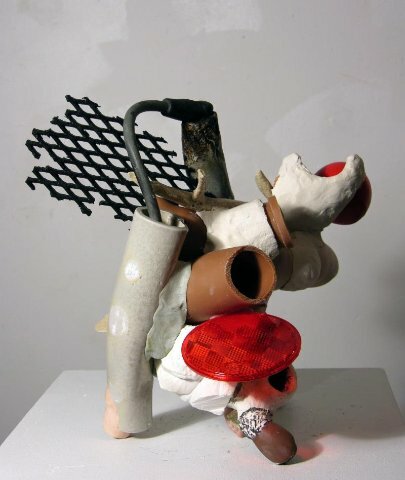 As a sculptor Linda Leslie Brown's work metaphorically plays with the literal and the imagined as seemingly random, mostly discarded materials interact to build works rife with allusions to the body. At the same time, her sculptural assemblages suggest the plastic, provisional, and uncertain world of a new and transgenic nature where corporeal and mechanical entities recombine, serving as relics of possible futures and symbols of human behavior on the global environment. Her sculptures suggest a creaturely symbiosis as with holobionts: assemblages of different species that form ecological units. Each form is vulnerably porous with holes connecting and circulating energy through tubing of various colors and translucencies. The title of this exhibition, Plastiglomerate, is adopted from the name of a new substance created through heat fusion of plastic bits, sand, and other materials. It has been identified as a new form of rock said to be a geological marker of the Anthropocene era. In this era, humans are responsible for changing the earth and its beings in ways we can't entirely predict. Plastiglomerate summons an image of the overwhelming omnipresence of plastic, a human-made substance that cannot be truly thrown away as seen through the massive gyres of plastic in the Pacific, and the understanding that plastic does not disappear, but simply breaks down into tiny and tinier bits, which end up everywhere. Brown's work invites viewers to engage in an intimate examination that is both disturbing and delightful.